As with most of the Dog Wizard family, Paul’s love and affection for dogs and his relationship with our furry friends have been lifelong. Originally born in Durham, England Paul moved to Atlanta with his family in his early childhood and attended the University of Georgia. After building a career in the hospitality industry he would eventually seek a path that he could truly be passionate about traveling. 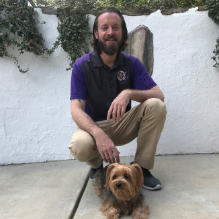 Once that decision was made, his affinity for all things canine drove him to take the leap into the world of dog training, leading him to the Dog Wizard Academy and eventually making his home here in Orlando. Here he developed his existing understanding of canine behavior and added some of the most complete and innovative training skills available. In the ever-evolving world of dog training, Paul hopes to continue to grow and understand the fascinating nature of our faithful companions, helping them and their owners alike enjoy a more rewarding relationship. the office. Their daily routine includes talking with dogs and their people about their goals in training, scheduling appointments, and managing the office tasks. The best part of her job is being part of such a wonderful team, and helping build positive relationships between people and their pups. In her free time, Rachel loves to play roller derby and macrame. Rachel is a passionate outdoor enthusiast and enjoys spending time outside hiking with Lucy and her two active and energetic sons. 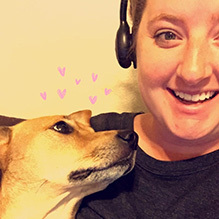 Amy has been with the Dog Wizard Office team since December 2016! Amy has a very important role with being the first point of contact for Dog Wizard clients. She helps manage the day-to-day needs, phone calls, and appointments which she does so well. 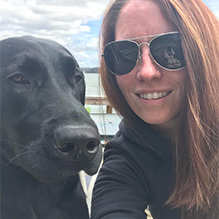 Amy has a passion for helping customers at the highest level and ensuring they feel great and know that there is hope for their dog. The best part about her job is not only getting to talk with clients about their dogs but also having her rescue mutt, Winston, hang out with her all day! When she’s not helping us in the office she can be found enjoying the outdoors with Winston. We are grateful to have her on our team! Chloe is a New York native! She began working with people with disabilities while obtaining her bachelor’s in Social Work. 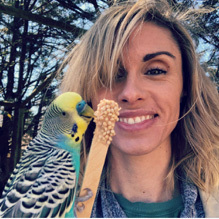 Throughout this journey, she noticed much of her free time was spent caring for animals, so she began a dog sitting business. She took it upon herself to volunteer and give back to the community at local animal shelters and sanctuaries in her free time. Chloe used to competitively ride horses but now just enjoys riding in her free time. 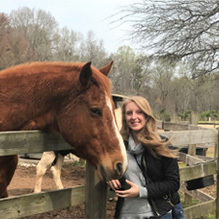 Chloe discovered these experiences brought her immense happiness and consequently to shift her career toward one involving helping animals. Chloe is a proud and loyal member of our Dog Wizard family. When you talk to Chloe about your dog and the troubles you are having you will immediately feel at ease with her compassion for you and your dog! One of the best parts of her job, she gets to spend time at home with her two pups Bax and Benji.